A new study by Delhi-based non-profit Centre for Science and Environment (CSE) has shown that 84 per cent of bread and bakery samples collected from the city contain residues of potassium bromate, potassium iodate or both. Potassium bromate (KBrO3) and potassium iodate (KIO3) are chemical food additives which, according to Indian food regulations, can be used by bread makers and bakeries as flour treatment agents. Potassium bromate helps achieve high rising and a uniform finish. But the safety of these additives is under a cloud. Popularly used in many parts of the world a few decades ago, potassium bromate was allowed based on the assumption that no residue of bromate would be found in the final product. However, studies began to find detectable residues of bromate in finished products. Other studies showed that bromate was a possible carcinogen. In the 1980s and early 1990s, global scientific expert committees began reducing the allowed limit of use for bromate. Eventually, they recommended not using potassium bromate at all, a warning that was heeded in many countries. Potassium iodate is also banned in many countries as it can lead to higher intake of iodine, which can potentially affect thyroid function. But India continues to allow the use of these treatment agents, exposing people to the risk of consuming them through bread and bakery items. To find out if potassium bromate and potassium iodate are present in different types of breads, the Pollution Monitoring Laboratory (PML) at CSE collected 38 bread and bakery samples from retail shops, bakeries and fast food outlets in Delhi during May-June 2015. The samples included popular varieties of white bread, whole wheat/atta bread, brown bread, multigrain bread, sandwich bread, pav, bun, ready-to-eat burger bread and ready-to-eat pizza bread. The tests were conducted on a UV-visible spectrophotometer using a published method. Both potassium bromate and potassium iodate oxidise the dye, producing the same colour and indicating the presence of either one or both chemicals. The results were startling. Thirty two of 38 samples or more than 84 per cent of samples tested were found to contain potassium bromate and/or iodate in the range of 1.15–22.54 ppm (parts per million). 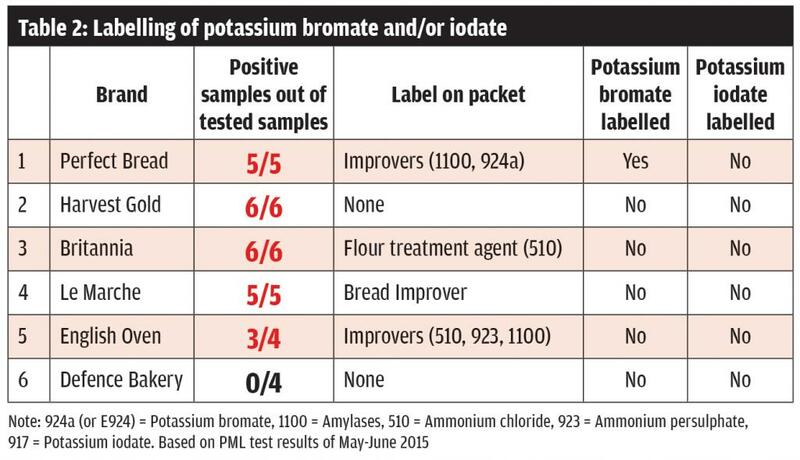 Moreover, residues of potassium bromate and/or iodate were found in all product categories tested by PML (see ‘A grim report card’). All samples of white bread, pav, bun and ready-to-eat pizza bread were found to contain potassium bromate and/or iodate. Nineteen of 24 samples or 79 per cent of bread and about 75 per cent of ready-to-eat burger bread also tested positive for the chemicals. The highest level of potassium bromate and/or iodate was found in sandwich bread. This was followed by pav, bun and white bread. Even the average level of the residues was high in these product categories. Products of all seven popular fast food outlets selling pizza and burger tested positive for potassium bromate and/or iodate, but at levels lower than those found in bread, pav and bun. Download the CSE Policy Brief (POTASSIUM BROMATE/IODATE IN BREAD AND BAKERY PRODUCTS) and CSE Lab Report (Potassium Bromate or Potassium Iodate in Bread). View the CSE presentation here. To confirm the results of PML, CSE selected four samples of the brands tested earlier and sent them to a reputed third-party application laboratory in September 2015. These samples were of the same products, but belonged to different batches and were produced on different dates than those tested earlier by PML. The third-party lab conducted its tests using ion chromatograph with conductivity detector, a prescribed technique to detect bromate. PML also tested these four samples. Their results confirmed the presence of bromate residues in two samples—Harvest Gold and Perfect Bread (see Table 1). They also confirmed the absence of bromate residues in breads of Defence Bakery. Britannia was the only sample in which there was no bromate, indicating that the residues found by the CSE study were of potassium iodate. The results of the external lab also confirm the use of potassium iodate by the bread-making industry. 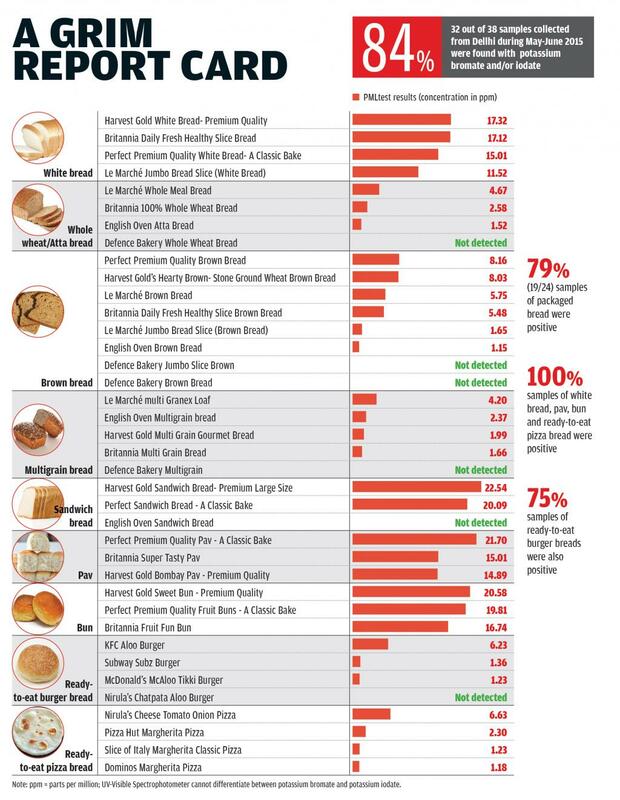 Perfect Bread, which tested positive for potassium bromate and potassium iodate, is the only brand to declare that it uses potassium bromate on its label (see Table 2). Harvest Gold, which tested positive in PML as well as third-party lab tests, and Defence Bakery do not even label the class title—flour treatment agent—as required by the Food Safety and Standards (Packaging and Labelling) Regulations, 2011. Further, the class title labelled across brands is inconsistent. No other packaged bread maker mentions either additive, even if they tested positive in PML tests. There were no labels on bread for ready-to-eat pizza and ready-to-eat burgers as they are non-packaged and are not required by existing laws to carry such labels. The other five companies that categorically denied the use of these additives were Slice of Italy, McDonald’s, Pizza Hut, KFC and Subway, all of which are fast food brands. Le Marche said it was not aware if potassium bromate was being used in the improver mix they sourced for bread-making (see ‘Passing the buck?’). Harvest Gold Industries, LR Foods Pvt Ltd (makers of Perfect Bread), Mrs Bector’s Food Specialties Ltd (makers of English Oven Bread), Nirula’s Corner House Private Limited and Domino’s Jubilant FoodWorks Ltd have not responded to CSE’s requests for reactions yet. Evidence about the health effects of potassium bromate and potassium iodate were mounting through the latter half of the 20th century. In an evaluation in 1986, the International Agency for Research on Cancer (IARC), associated with the World Health Organization (WHO), stated that there was sufficient evidence to show the carcinogenicity of potassium bromate. The chemical was found to cause renal tubular tumours (adenomas and carcinomas), thyroid follicular tumours and peritoneal mesotheliomas in laboratory animals. In 1999, IARC acknowledged that exposure to potassium bromate could occur due to its use as a dough conditioner and classified it as Class 2B which means “possibly carcinogenic (cancer-causing) to humans”. The Joint Expert Committee on Food Additives (JECFA), administered by WHO and Food and Agriculture Organization (FAO), had started evaluating potassium bromate as a flour treatment agent in 1964. In 1983, the committee temporarily accepted the use limit of 75 ppm, provided there were negligible residues in the end product. It was assumed that all bromate gets converted into bromide during the baking process. In 1989, however, the committee endorsed its earlier recommendation that “as a general principle, bromate should not be present in food as consumed”. When residues of bromate continued to be detected in finished products, the committee reduced the use limit to 60 ppm. In 1992, JECFA stated that “the use of potassium bromate as a flour treatment agent was not appropriate”. With the availability of safer alternatives, the use limit of 60 ppm was finally withdrawn. Long-term carcinogenicity studies and in vivo and in vitro mutagenicity studies showed that potassium bromate was a “genotoxic carcinogen” or a chemical agent that damaged genetic information, causing mutations. In 1995, JECFA reiterated its conclusion of 1992 because evidence showed that even when potassium bromate was used for flour treatment at “acceptable levels”, bromate was nevertheless present in bread. In 2012, Codex Alimentarius, an international food safety reference agency of the WHO and FAO, formally removed potassium bromate from the list of additives in line with the JECFA view. 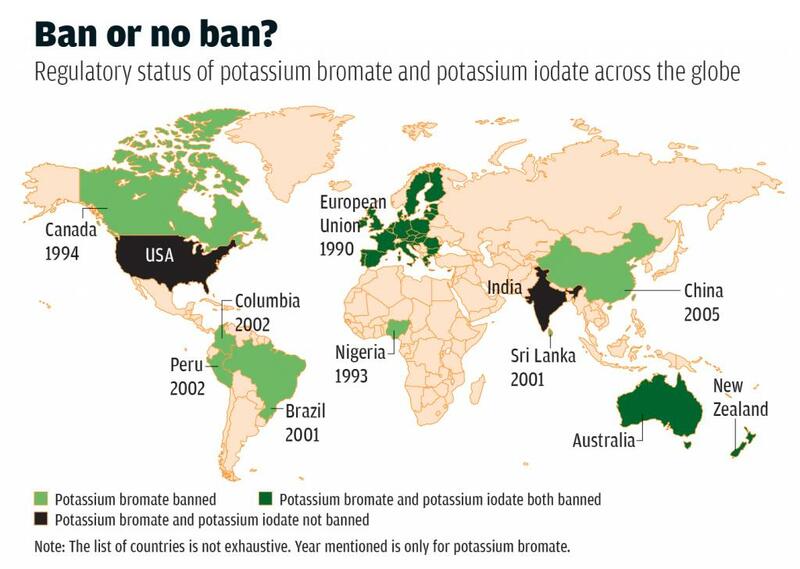 European countries and the UK were the first to heed the recommendations and ban the use of potassium bromate in 1990 (see ‘Ban or no ban?’). Countries like Australia, New Zealand, Canada and China followed suit. A spokesperson from UK’s Food Standards Agency wrote to CSE in an email: "Until 1990, it had been permitted in the UK as a flour improver, but was removed from the permitted list following a review from the UK Committee on Toxicity (COT). Since 1995, food additives legislation has been harmonised within all Member States of the European Union, including the UK. Potassium bromate is not included on the current additives positive list and is therefore not permitted for use within the EU." Similarly, in 1965, JECFA recommended that potassium iodate should not be used as a flour treatment agent due to the possibility of a higher intake of iodine. The committee stated its use may result in the intake of iodine at a level which is five or 10 times the daily recommended (100-200 µg) value. Iodate is used in smaller quantities to iodise salt than when it's used to treat flour. Also, salt is consumed in smaller quantities unlike bread. Accordingly, iodate is not found in the approved list of food additives in many countries. The European Food Safety Agency referred to studies in its scientific opinion of 2014 which state that both insufficient and excessive iodine can lead to thyroid disorders, and hypo- and hyperthyroid status in humans. Chronic excessive iodine intake may accelerate the development of sub-clinical thyroid disorders to overt hypothyroidism or hyperthyroidism, increase the incidence of autoimmune thyroiditis and increase the risk of thyroid cancer, it adds. With changing food habits and paucity of time, Indian consumers are increasingly opting for bread as part of meals. "We consume around three to four packets of bread per week in our five-member family. Bread is easy to consume, instant, quick and a handy food option due to which I prefer it for my children," said Poonam Talwar, a housewife and resident of South Delhi. While white bread accounts for about 75 per cent of the market share, brown bread and multi-grain bread are among the fast-growing segments due to rising health awareness among consumers. 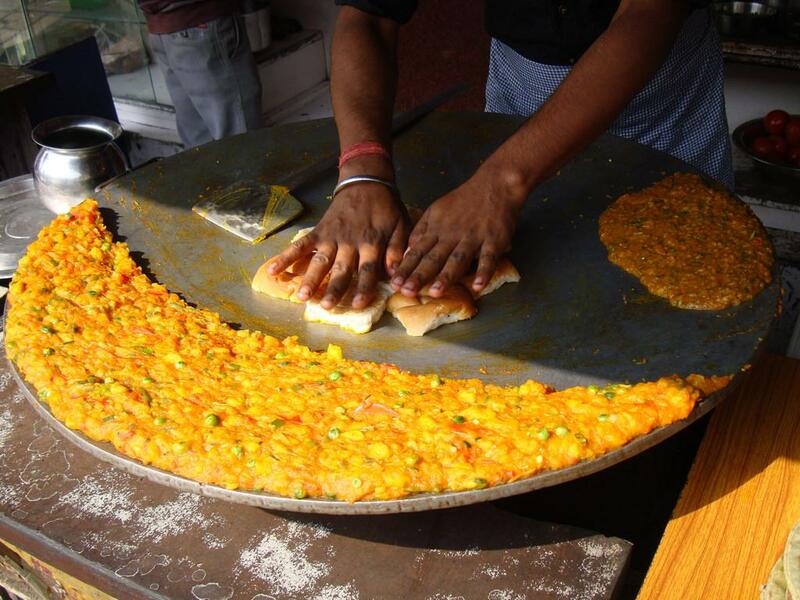 "We only purchase Atta Bread because we consider it as healthy as roti," added Talwar. The Indian bread industry, estimated at Rs 33 billion in 2015, is expected to grow at 10 per cent and touch Rs 53 billion by 2020, according to market intelligence firm ValueNotes. Other factors driving the growth of the industry are increasing disposable incomes, growth in the organised retail sector and increasing consumption of packaged food. While the urban market constitutes about 65 per cent of the demand, rural demand is growing faster. Britannia, Modern Foods, Bonn, Kitty, Harvest are among the market leaders. With rising preference for bread among Indians, food safety regulations in the country demand attention considering the potential adverse health impacts of potassium bromate. While the Food Safety and Standards Authority of India (FSSAI) had discussed the issue of banning potassium bromate in 2011, it has not taken a final decision yet. 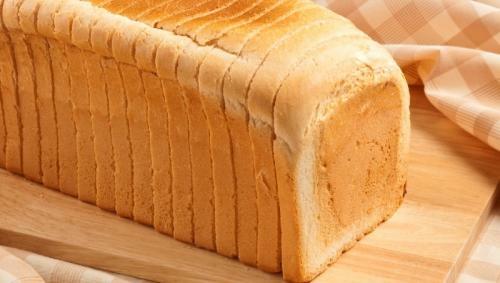 Maximum level of use of potassium bromate and/or iodate in bread is set at 50 ppm. Maximum level of use of potassium bromate in flour for bakery is set at 20 ppm. Maximum use limit of potassium bromate is set at 20 ppm in maida (refined wheat flour), if used for bakery. These regulations are insufficient to ensure the safety of finished products, says CSE. Monitoring how much of the two additives bread makers use during production requires onsite inspection. This may not always be possible. Also, since it was assumed that the use of potassium bromate does not leave behind any residues in finished bread, residue limits were never set. As a result, the presence of residues cannot be used to establish overuse of the chemicals by the producer. There is limited clarity on clubbing potassium bromate and/or iodate, as one of the two (potassium bromate) is linked with cancer and is individually addressed otherwise, for example in flour for bakery. Clubbing the two anyways leaves a big range for bread makers to use potassium bromate. Additionally, as potassium bromate is allowed in flour for bakery and/or maida for bakery, residues of it could be present in other bakery products not tested by PML. Bureau of Indian Standards (BIS) also provides standards for a few bread variants, allowing potassium bromate and/or potassium iodate to be used in white bread and wheat meal bread. Potassium bromate is also allowed in protein-fortified bread and milk bread. Effectively, potassium bromate can be used up to 50 ppm levels. Existing food packaging and labelling standards leave gaps for the use of flour treatment agents such as potassium bromate and potassium iodate. While the standards require the name or recognised identification number of additives to be mentioned on labels in case of pre-packaged foods, there is no such requirement in place for flour for bakery. “People are not aware if they are using potassium bromate as they use improver mix. But this improver mix mostly has potassium bromate. Sometimes ascorbic acid is also present in combination,” said Ramesh Mago, owner of Kitty Industries and president of All India Bread Manufacturers’ Association (AIBMA). Gaurav Sukwani, managing director at Popular Foods and Bakers, Agra, made the same claim. “Instead of direct use of potassium bromate or ascorbic acid, manufacturers mostly use improver mix because quantity precision is needed. Bromated improvers are most popular as they give a perfect finish to the end product,” he said. Industry and scientific experts confirm that potassium bromate is widely used by bread makers because of the quality of results it provides. “Potassium bromate is available in the market and is not banned yet by the FSSAI, therefore manufacturers are using it. It is not a violation of rules. Nothing can beat potassium bromate as a treatment agent,” said Mago. Ascorbic acid is considered a healthy alternative by experts, but it is a fast-acting oxidising agent and does not lead to comparable results. “Potassium bromate is the most popular flour treatment agent used in bread-making because it is cheaper and gives better results than other alternatives such as ascorbic acid,” said D Indrani, principal technical officer at Central Food Technological Research Institute, Mysore. Glucose oxidase is another alternative which was approved by FSSAI in 2015. Other improvers and flour treatment agents approved by law include ammonium persulphate, ammonium chloride and amylases. Though bread is a low-value, low-margin and high-volume business, the cost of adopting safer alternatives is insignificant, says CSE. At an approximate per kg price of Rs 330 for potassium bromate, Rs 450 for ascorbic acid and Rs 6,500 for glucose oxidase, the cost of using only potassium bromate is less than one-sixth of using ascorbic acid and less than one-eighth of using glucose oxidase alone. These costs are calculated as per 50 ppm and 200 ppm, the maximum use limits for potassium bromate and ascorbic acid respectively as per law, and at 20 ppm of glucose oxidase as an average recommended dose. However, in absolute terms, the increase in cost is minimal. For a 400-g loaf of bread, it is less than 1.5 paisa for ascorbic acid and 2 paisa for glucose oxidase. The FSSAI should prohibit the use of potassium bromate in making bread and bakery products with immediate effect. Considering that it can cause cancer, is banned in most parts of the world, and has healthy alternatives, there is no reason why this chemical should be allowed, specifically when residues are found to be present in the end-product. Complete prohibition would ensure that this chemical is not used in improver mix, as part of maida or flour for bakery. It will also ensure that it is not used in proprietary foods such as ready-to-eat burger bread and ready-to-eat pizza bread which don’t carry any labelling according to current laws. The use of potassium iodate as a flour treatment agent in bread and other bakery products should not be allowed by the FSSAI. It is not recommended as a flour treatment agent in several countries due to possible higher intake of iodine which can potentially affect the functioning of thyroid. BIS should amend relevant available standards. This would ensure that both potassium bromate and potassium iodate are not allowed as improver/flour treatment agents in bread and bakery products. Why no action is taken by the State Government/ Central Government against big gaints in Bakery Products - Perfect Bread, Harvest Gold and Britannia were found to contain high average levels of potassium bromate and/or iodate. Harvest Gold Sandwich bread had the highest concentration of the chemicals. Now -a days most of the FBO,s are printing FSSAI license number.Does it mean the respective authority has good control over their product or process?